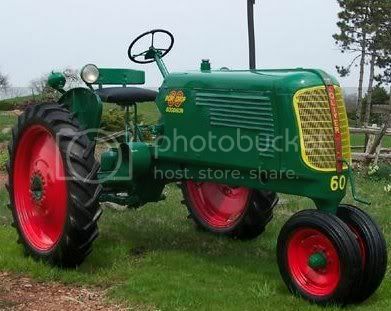 Oliver Farm Equipment began producing the Model 66 row crop tractor in 1949, and it had a 6 year reign. This two-wheel drive tractor had a six forward-speed transmission with two reverse speeds. Farmers had their choice of either a gasoline-ran row crop tractor or diesel-ran standard tractor. Both Oliver-Waukesha engines were Vertical I-head engines with four cylinders. A couple of big differences between the two tractors were the weight and compression ratio. The row crop 66 weighed in at 3,193 pounds, and the standard diesel model weighed 3,795 pounds. The gasoline engine had a compression ratio of 6.75 to 1, while the diesel engine had a ratio of 15.5 to 1. When comparing horsepower, the gasoline-powered 66 got a max belt power of 24.9hp, and the diesel-powered engine had 25.03hp.